Fireweed bloom in the fall on the year, and Alaskan lore says that when the fireweed cease to bloom, winter will be close at hand. So it is that when I look at the hills blazing with fireweed in the sun, I cannot help but think of the winter soon to come. Hopefully, before the ice freezes thick on these mountain streams, a few more ounces of gold will see the light of day. I spent Friday evening loading up my 5" subsurface dredge. 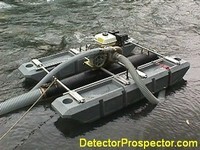 Since I have retired my 6" dredge, this will be my workhorse in the future. I am very pleased with the unit, which is incredibly more portable and uses half the fuel of my old dredge. I was thinking of bringing my 4" subsurface to Mills, but decided the small extra weight was worth the extra capacity to move gravel. This is the same unit I used at Mills Creek last summer, but with marlex floatation instead of the inflatable pontoons. I decided I liked the durability of the marlex over the compactness of the pontoons. I took all of Saturday to clear a trail to my worksite and set my dredge up. I prepared to go over some ground below a bedrock outcropping where I had found gold last year. It is a good thing we have long daylight hours in the summer, as I worked until 9PM to get everything ready for Sunday. Sunday I put in a long day of dredging. I worked from 10AM until 9PM and got roughly 10 hours of dredging in. The dredge worked well, and I did find gold, but had to work for it. The gold was evenly dispersed over a wide area in bedrock crevices. There was little gold in the overlying material, and so the day was spent splitting crevices open to reveal the gold inside. Unfortunately, this is time-consuming work, and I ended up with 1/2 ounce of gold for the day; about 1 pennyweight per hour. Not exactly getting rich quick, but not bad for a new area. One nugget was just over 1 pennyweight. The subsurface box did well on the rather substantial amount of finer gold that was recovered from the crevices. I had taken Monday off from work, so put in about 5 hours more dredging, with similar results of about 1 pennyweight per hour. This gave me another 1/4 ounce of gold, or 3/4 oz for the weekend. The gold is a little smaller than that from downstream, but I hope that is just because of all the bedrock splitting. I hope to get into some coarser gold in the deeper, faster water areas. The area was pleasant to work, however, with shallow bedrock and relatively slow water, so it was a real pleasure compared to most of my dredging at colder times of the year. Jeff was working downstream but I did not see him at all over the weekend. I was just too tired each night to make the trip downstream to visit. By the time I put my dredge up and pulled up camp, he had already left for home. When I got back to work Tuesday, He revealed that he had found just over an ounce of gold, and that the hot streak had played out, so he had moved upstream a little. Now that I have my dredge on-site, and have a basic campsite set, I will be able to concentrate more on mining in the coming weeks. I have hopes of reasonable gold in this stretch of creek, with plenty of material that is workable even at higher water levels. Jeff and I both plan to take off significant amounts of time in September to mine at Mills Creek. Hopefully the weather cooperates by not getting too rainy.